Media Matters attacks Fox for its silence on a big news story. But it’s Eric Boehlert, so you know there’s a catch. Here’s what Special Report did not include in that taped segment: The Dow Jones Industrial Average yesterday rose to its highest level in three years. Note the curious wording: ‘did not include in that taped segment’. If something isn’t in a ‘taped segment’, does that mean that it wasn’t reported at all? Of course not. So why phrase it that way? 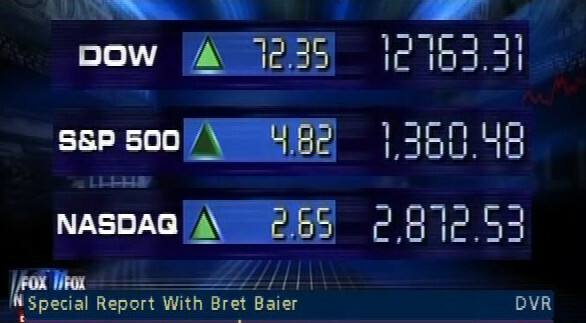 Perhaps because just seconds after Boehlert’s video clip abruptly stops, Bret Baier continued with a regular nightly segment: reporting the day’s economic news. Referencing the stock market’s continued upward trend, Mr Baier then read the very Dow numbers that Boehlert said Fox was silent about! 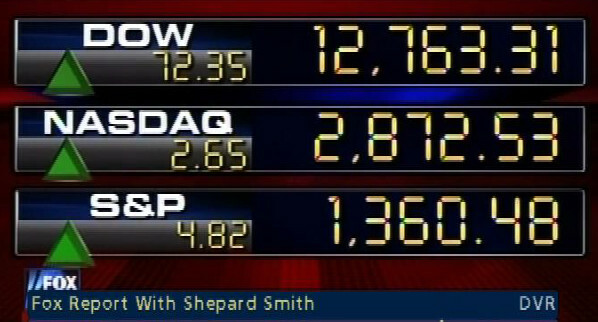 What’s more, one hour later Shepard Smith reported them too! How exactly could Fox News have been ‘mum’ about something when they reported it twice? Why did Eric edit a tape of Bret Baier so that it cuts off just seconds before it proves Boehlert’s claim false? By the way, a check of CNN transcripts for Thursday evening turned up no mentions whatsoever of the stock market results. They actually were mum on the subject, and Eric doesn’t even mention them! It takes a deliberate effort to edit video in such a dishonest fashion, but Eric Boehlert has a long history of lying about Fox News. Apparently, if you are a ‘Senior Fellow’, old habits die hard.